To read more of Derek’s articles, click here, or go to the link above. Having worked with sprinters and speed athletes for the better part of my life, I am always fascinated at how making an athlete faster can benefit them in many ways. 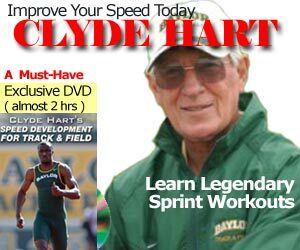 One of the key concepts passed on to me by Charlie Francis was the concept of “Speed Reserve”. By training an athlete to be faster, you can increase his or her abilities not only in the maximal acceleration and maximum speed realm, but also for all of the sub-maximal speed activities that occur in the spectrum below maximal performance abilities. 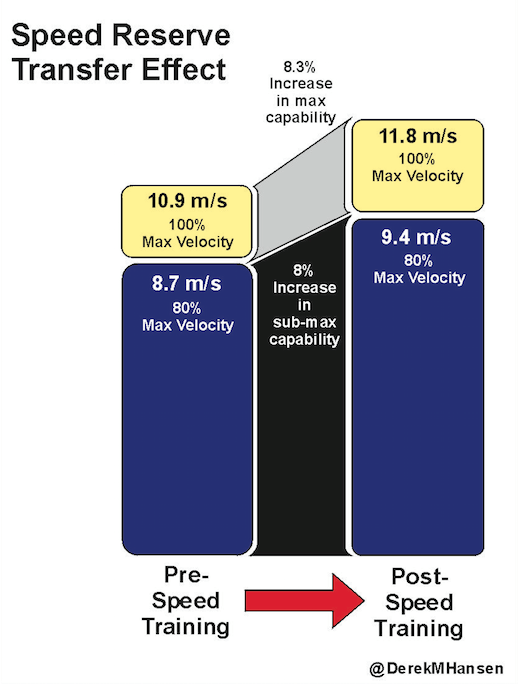 As illustrated in the diagram below, if you can increase an athlete’s maximal acceleration and speed, all of that athlete’s sub-maximal capabilities will be elevated as well. Thus, an athlete that runs a 40-yard dash in 4.3 seconds will find it very easy to cruise around the field at a velocity equivalent to a 4.7-second 40-yard dash. A good example of the concept of speed reserve is demonstrated every four years in the Summer Olympic Games, where the favourites in the 100m dash run through the qualifying rounds at a sub-maximal intensity, advancing to the next round with a good deal of fuel left in the tank. In order to be in contention for a medal in the 100 meters, you must first have the maximal speed capabilities in place to run through the heats at a relatively pedestrian pace. An athlete who hopes to ultimately win the 100m final in under 9.70 seconds, can easily qualify by running around 10.10 seconds in the opening round, 10.00 in the quarter finals and anywhere between 9.90 and 10.00 seconds in the semi-final rounds. This would roughly be equivalent to running at 95.0 to 97.5% of this athlete’s maximal abilities. While such performances may still appear to be incredibly fast, it is profoundly less stressful to a well-seasoned sprinter poised to challenge for an Olympic gold medal. Athletes that do not adhere to this progression and are forced to run at 100% of their abilities in any of the qualifying rounds will likely run a disappointing race in the finals. An athlete who has exceptional maximal sprint capabilities can still operate at very high speeds during a match or game and not fatigue, since most team sports operate at much slower speeds as proven by GPS technology. Thus, an athlete that is well trained from a sprinting perspective will always demonstrate exceptional repeated sprint abilities throughout a practice or competition session. Athletes that only practice at “practice-speed” will find that they will never reach their speed potential, and may be at higher risk for a hamstring strain when they are required to sprint at maximal capabilities, especially for repeated efforts.